Our company has mastered the art in offering 820141 Earthing Round Sticker to the clients. 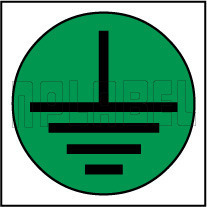 820141 Earthing Round Sticker is manufactured by adept personnel using quality assured paper and other allied material as per the set industry standards. Offered range is high on demand in the market for excellent adhesive quality and optimum quality. This product is available in different sizes and can be modified in any shapes and sizes as per the demands of patrons. Offered range is well checked for quality on series of quality parameters before being supplied to clients. We have just launched our E-portal where you can purchase labels online. National Process Private Limited" is a remarkable organisation that was founded in the year 1968 at Ahmedabad (Gujarat, India). We are instrumental in manufacturing, exporting and supplying a wide range of Metal Labels, Self Adhesive Labels, Vinyl Stickers, Laser Engraving And Cuttings, Pu Coating Labels, Standard Labels, Industrial Caution And Warning Labels, etc. Well known for their attractive design, thermal resistance, attractive look and durability, these are broadly demanded in the market. We offer these products in different designs, colors, sizes and can be customised as per the needs of the clients within promised time frame. Owing to the features of these products, we export these products to Dubai, Europe, USA, Kuwait, etc.